We women deserve to be pampered. So do our nails! 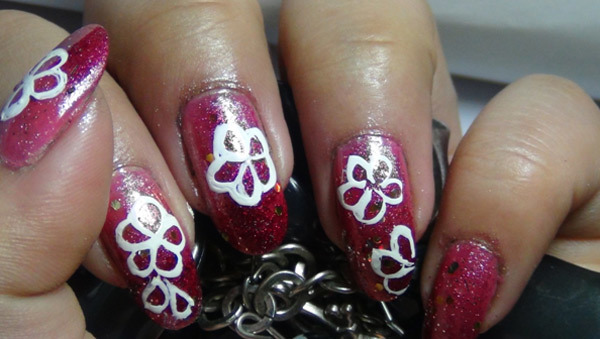 What better way to pamper our nails then to decorate them with nail art? 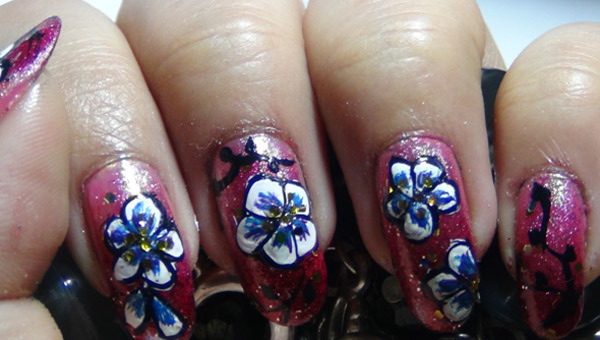 Most of us girls like to sport easy to do floral designs on the nails. 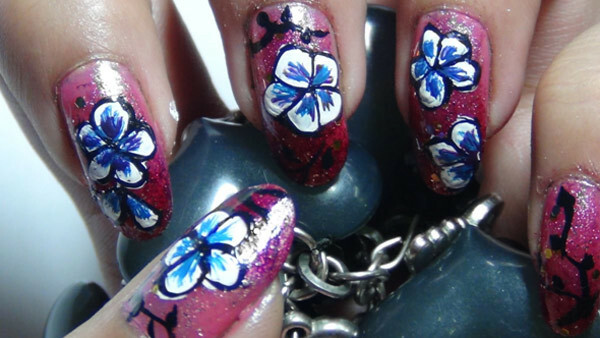 When the topic of hand painting comes, floral patterns are some of the most common designs that you will see on nails. Floral designs are not difficult to draw and can be sported everyday as well as during special occasions. So let us see how we can draw a sparkling floral design! Use a base coat to protect your nails from the acrylic colours and chipping. Now use a layer of white nail polish. This will make the base more opaque. Base coat gives extra strength to your nails. So, if your nails are prone to chipping or breaking, you should never miss out on a good quality base coat. When the white nail polish is dried, use one or two coats of pink nail polish. Let it dry completely before moving on to next step. After the pink nail polish has dried properly, take magenta nail polish on a palette. Use the piece of sponge to sponge up the magenta nail polish all over the tip, extending a bit towards the centre of the nail. It should look something like Ombre nail. Now let it sit for about 2 minutes. Now take the silver nail polish on a palette and use a fresh piece of sponge to sponge up the silver all over the nails. It should look something like the picture below. If there is any stray nail polish, clean it up with a piece of cotton bud dipped in polish remover. Now take glitter polish and give a nice layer of glitter all over the nails. Let this dry completely before moving on to painting your nails. Once the nails are ready to be painted, take white nail polish on a palette and your thin nail art brush. Use this to draw up flowers like I have shown below. Paint up the demarcations of the petals. It should look something like the picture below. Now take black acrylic paint on a palette and your thin nail art brush. Use this to make some branches with buds on the tiny finger and some more branches on the empty spaces of the other fingers. Use this to give outline for the flowers and the petals. Refer the picture below for more clarity. Now give a few inner demarcations for the flowers at their centre. Use purple and blue color for this. It’s simple really! Take a look at the picture below and you’ll understand what you need to do better. Now take a few loose sequins or you can collect some sequins from your glitter polish and with the help of a toothpick place them at the centre of the flowers. Feeling excited about your nail art yet? Give a nice layer of top coat when the whole design has dried properly. Since the painting is done with acrylic paints, the colors may bleed if they are not properly dried. So make sure that the whole design has been given at least 10 to 15 minutes standing time before transparent polish is applied on it. Your design is now ready to flaunt! Hope you enjoyed this beautiful design. This is not difficult to do but it is a bit time consuming. So if you have some free time in your hand then do give this design a try. You can wear this with your floral outfits and also with your summer floral print dresses. 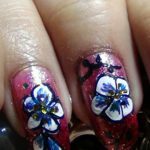 Here are a few hand paint nail art designs that you can try to keep your nails in the lime light all the time. These would certainly give you an idea to flaunt more. To all those who think that nail art is meant only for long nails, this colorful leopard print proves them wrong. You can use varied shades and combinations for this funky design. Neon shades also look good for this print. A nice diversion from the traditional French manicured nails! For girls who like to show off the length of their nails, this glittery nail art is the right choice. It is easy to do and the only thing you have to be careful about is the base color. It should not be too light. 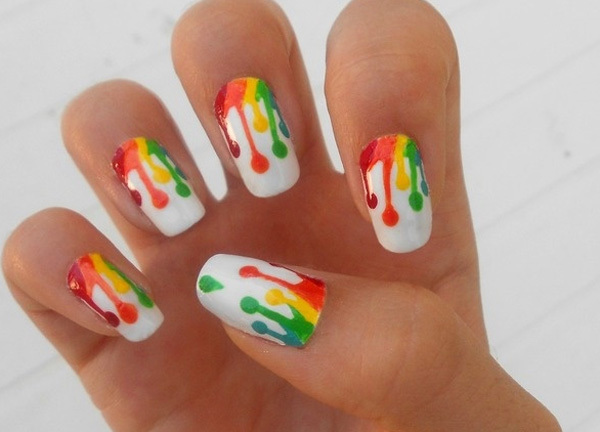 This multicolored nail art looks very trendy, but is a tedious task to design. The choice of colors is muted but the overall look is awesome. 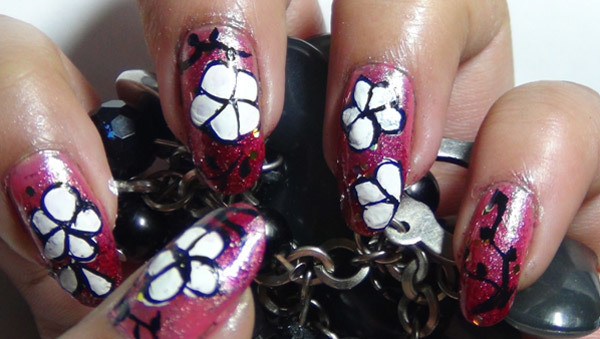 Moreover, this nail art is better suited for long nails. 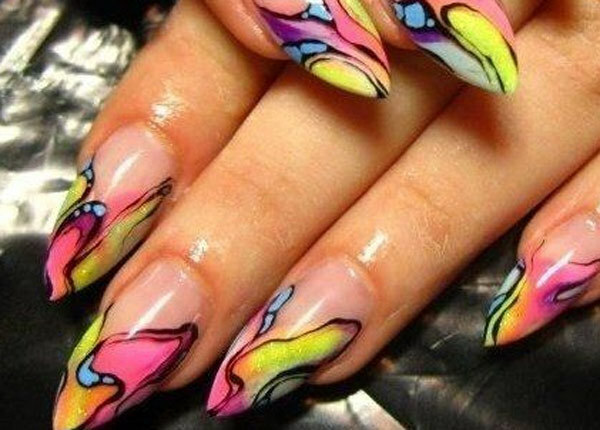 When digital print and neon colors are in, why not be a little innovative with the nails too? 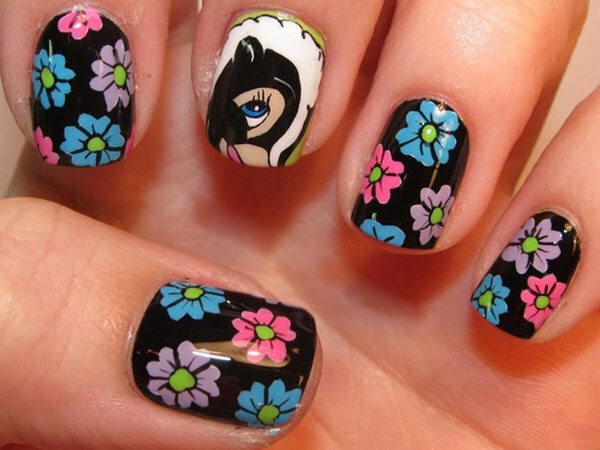 The colors used for this nail art are absolutely trendy and funky. The trick is to neatly brush the colors and combine them to give a bright look. Using too many bright colors can also be a disaster. The bright floral art on a black base is an amazing combination. Black is one such color that can highlight both, the print and its colors. And the best part is it never goes wrong. Even the dull shades come out well on a shiny black base. 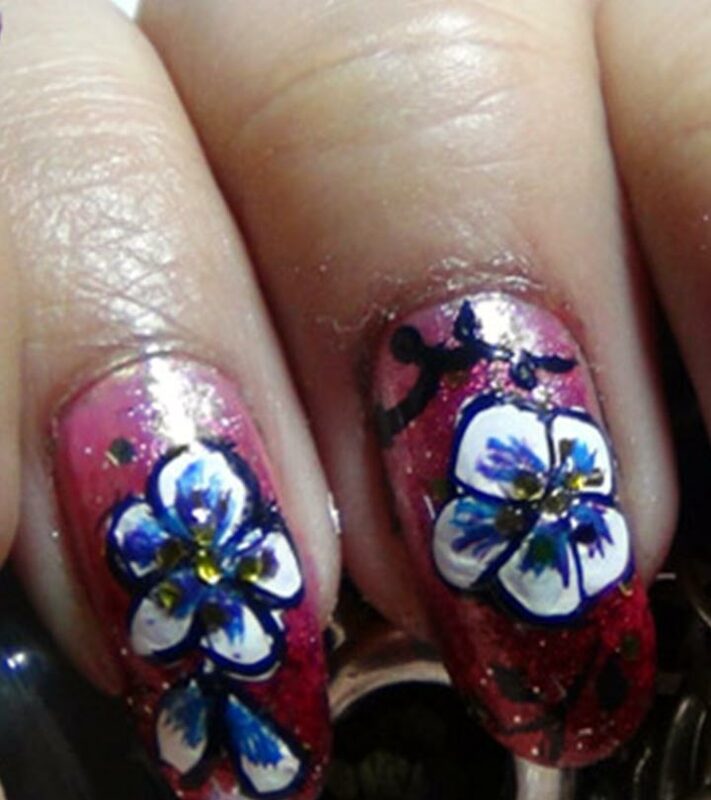 This hand painted flower nail art undoubtedly pacifies everyone! Shades of a peacock feather make the nail art look lively and it compliments any outfit and color. 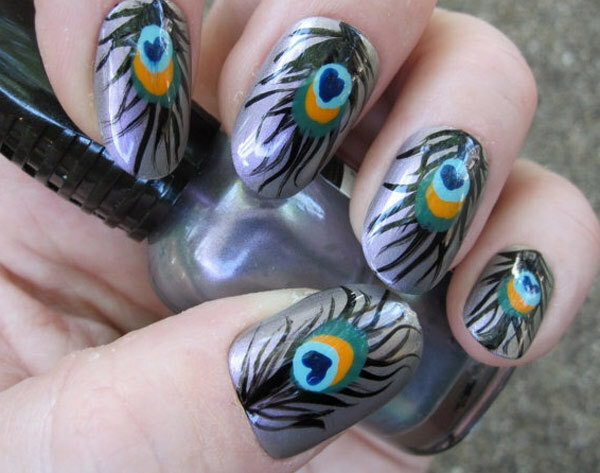 You can also use different combinations instead of the traditional peacock colors on the feather for the added drama. 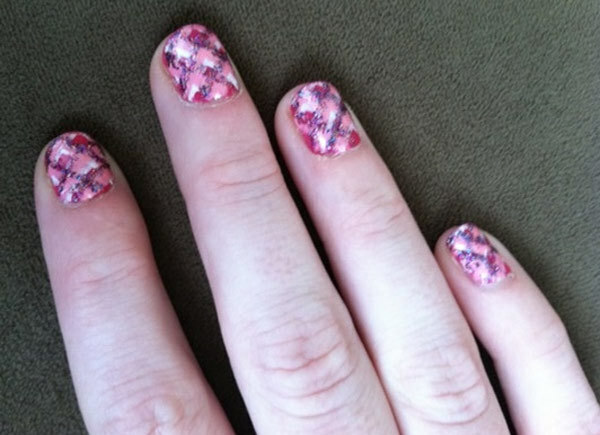 The uniform checkered print looks cute on the small nails. Use of pink and associated shades gives it a very girly and delicate look to the hands. Various color combinations can be used to experiment the color combination. Make sure you use the right shades to prevent this design turn into a disaster. 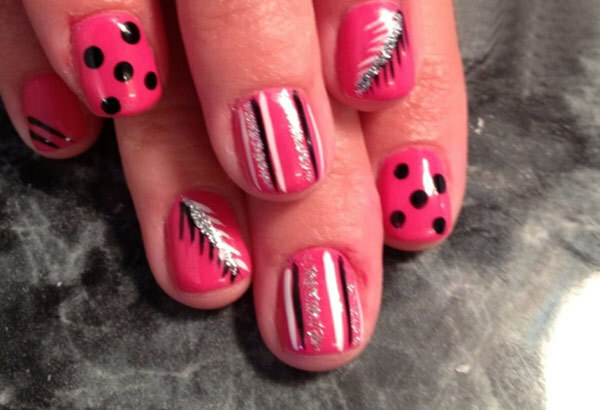 Polka dots, stripes and fern prints are wisely used to make the nails look attractive. The combination of the colors is very vibrant. This is easy to do and does not take much time. It is a funky art that can be done when you want a new look for a party. This jeweled nail art is very trendy and smart. The only criterion is that it can be done on broad nails; filed in a square shape is an added benefit. It is a nice way to show off the so called “space” on your nails. 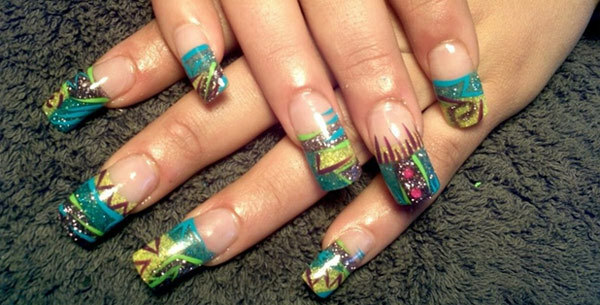 Free hand nail art is not everyone’s cup of tea. Done with a lot of finesse and vibrant combination of colors, the overall look is very appealing. 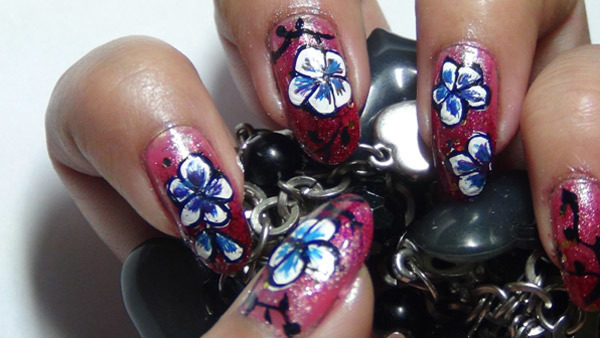 Have these hand painted nail art designs overwhelmed you? Just a bit of creativity can create unique designs on your nail! Do share your feedback if any in the comment section below. 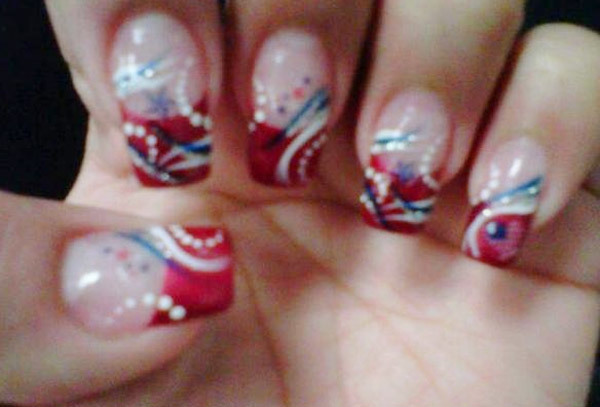 You can also check different categories of nail arts to suit your need. Just download the android app for nail art categories and try out the various designs.